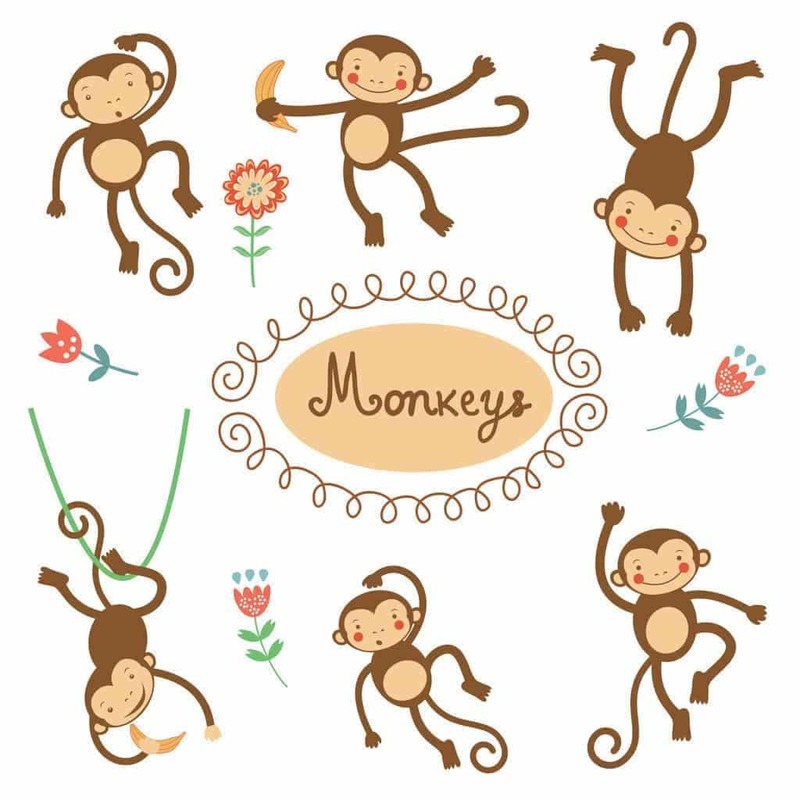 Monkey Curriculum for preschoolers through second grade. Have each child prepare a Monkey Dog by cutting a banana in half, spreading peanut butter on a hotdog bun that has been cut in half and then placing the banana inside (just like a hotdog) Eat & enjoy! This fun and easy cooking activity can be done with children as young as toddlers. First you start with a package of pizza dough. Melt butter or margarine in a dish Mix cinnamon and sugar in a dish or container. Have children break off pieces of dough the size of quarters or a little larger. dip the pieces in butter then sugar mixture. place in 8 inch pan and bake at 350 for 30 to 35 minutes. enjoy!!!!! You can also use 2 packages of dough for this recipe but you will need a bundt pan after baked flip onto a clean platter. Heat oven to 350 degrees. Spray a 9×13 pan with vegetable spray. Stir together flour, oats, sugar, baking powder, cinnamon, baking soda, salt and raisins in large bowl. Add banana, milk, egg whites, and vanilla. Beat until smooth. Spread batter into pan and bake until golden brown ( about 35-40 minutes). Serve warm or cool, cut into 2 inch squares. Teasing Mr. ALLIGATOR, you can catch me, you can catch me…. Along came Mr. ALLIGATOR quiet as can be……. Repeat song with four fingers, then three, then two, then one finger. The monkeys in the jungle say ooh, ooh, aah, all day long. Begin by having children slap their hands on their knees and then clap them together to set the rhythm of the chant. A (Monkey), A (Monkey) She wants to see a (Monkey)! Then have all of the children imitate a monkey. Keep repeating and naming different animals for the children to imitate and don’t forget the growls, screeches, and roars! This is also great for large motor indoors on rainy days. have lots of f un you see. Make a tree out of construction paper and put monkeys out of construction paper in the tree. Have the children count them. Cut out several monkeys and cut out some bannas from construction paper and have the kids put the bananna in the monkeys mouth, or on the monkeys mouth. Make a vine the size of the child’s desk. Put velcro on each leave (i made 4 or 5 leaves coming out of the vine.) Then make a monkey big enough to sit on the vine. Put velcro on the monkey or make him out of felt. Then everytime the child or class has a positive moment the monkey goes up the vine. Negative goes down. At the end of the day we gave monkey cheers to everyone who stayed or reached the top of the vine. If there is only one child left without reaching the top of the vine, I really tried to find him/her something to make a positive mark. Nobody wants to be the only one left behind. Also make LOTS of extra monkeys cause you will lose them.